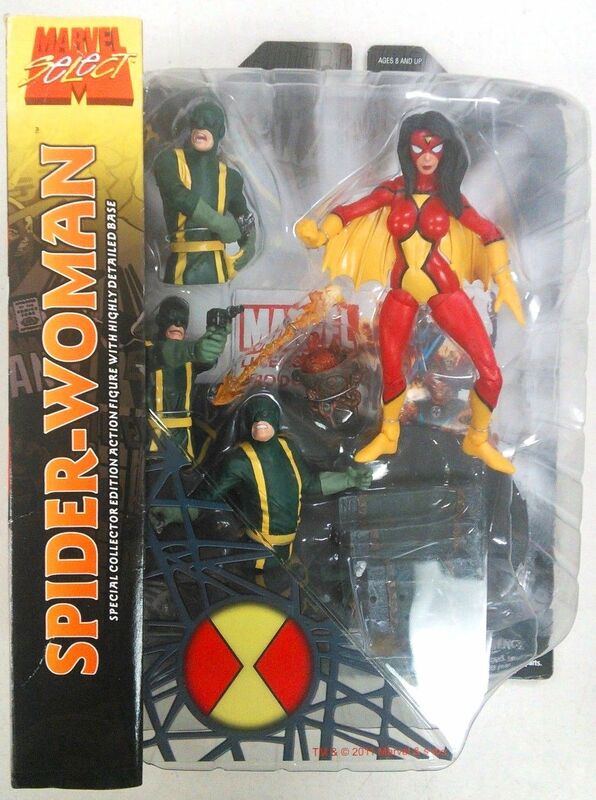 She's Fantastic: Marvel Select SPIDER-WOMEN! 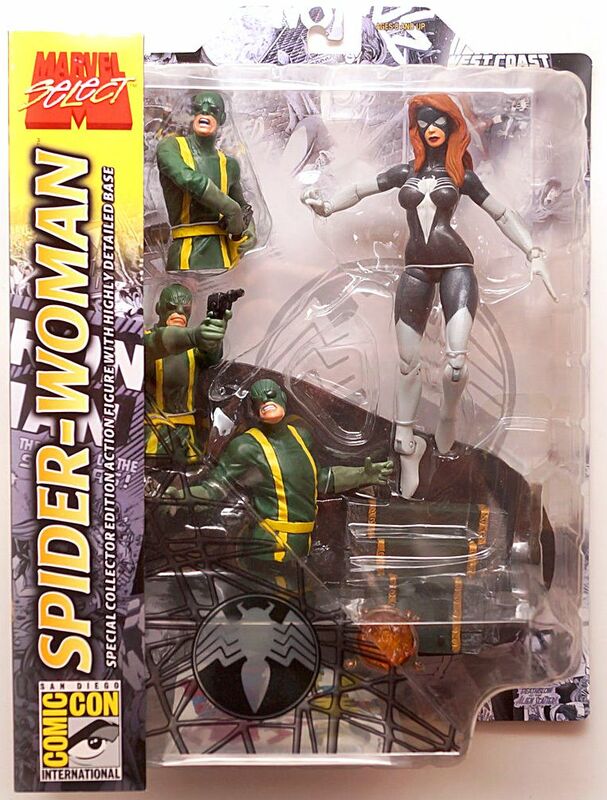 In honor of my giddy excitement for the Marvel Legends Spider-Girl reveal earlier this week, I decided to review three variations of my favorite Spider-Lady sculpt to date. Jessica Drew was a hasty creation by Marvel Comics in the late 1970s in order to secure the copyrights for a female spider-powered superhero. 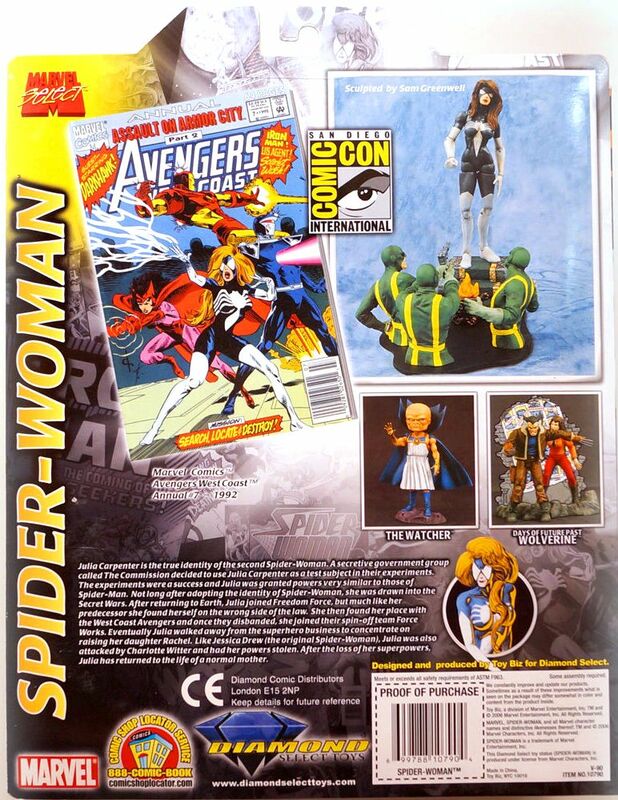 (I read once that word of Filmation's Web Woman cartoon reached the Marvel camp and they quickly created and published the first Jessica Drew story before her first episode aired). 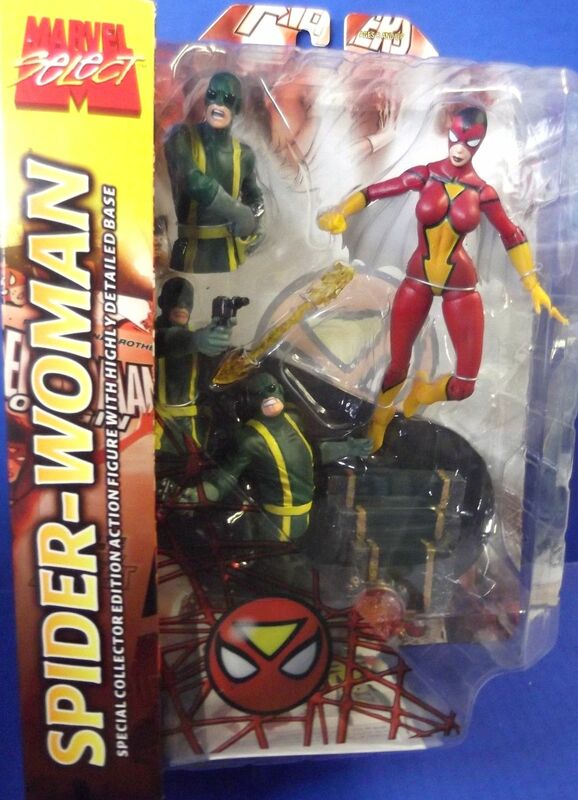 I was never a huge fan of Spider-Woman as a kid. I saw the cartoon a few times, but preferred Firestar from the Spider-Man & His Amazing Friends series. It wasn't until 2006 in the pages of New Avengers where Frank Cho drew two amazing Jessica Drew-centric issues (#14 and #15). 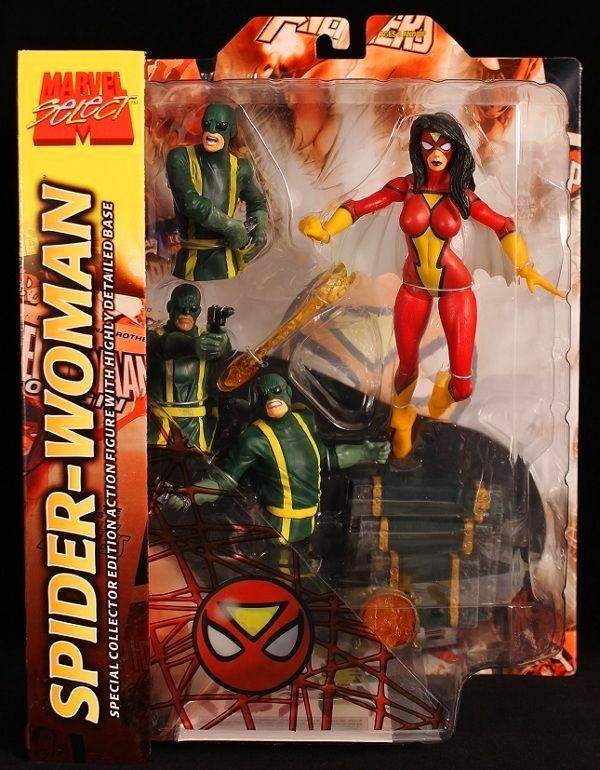 Coincidentally, Diamond Select Toys released their fantastic Spider-Woman action figure that same year in their Marvel Select line. There have been multiple variations released since, and I've purchased almost all of them. Let's check them out below! I have to start out by saying that some of the dates listed below are estimated. 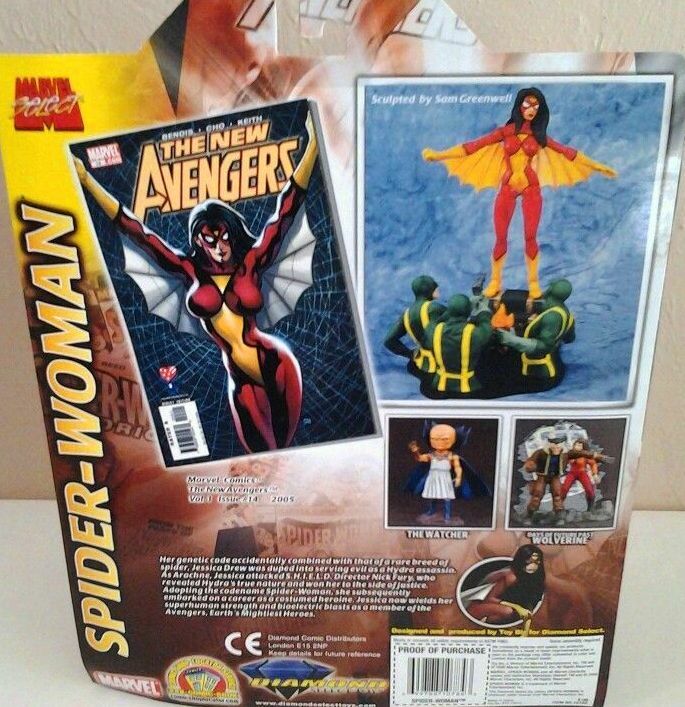 Marvel Select has a habit of having official re-releases (including a very recent Spider-Woman re-release at the end of 2013). I have researched as best as I was able and I have pretty strong memories of my purchases to back-up my findings. But if you have contradicting information, please let me know. Some things to note about this "regular" release: The circular logo on the lower front of her box is representative of her facemask. The Sam Greenwell sculpt is amazing as always. This was actually the first time I really took note of his work - and the first time I realized that fully-articulated female figures didn't have to look horrible. 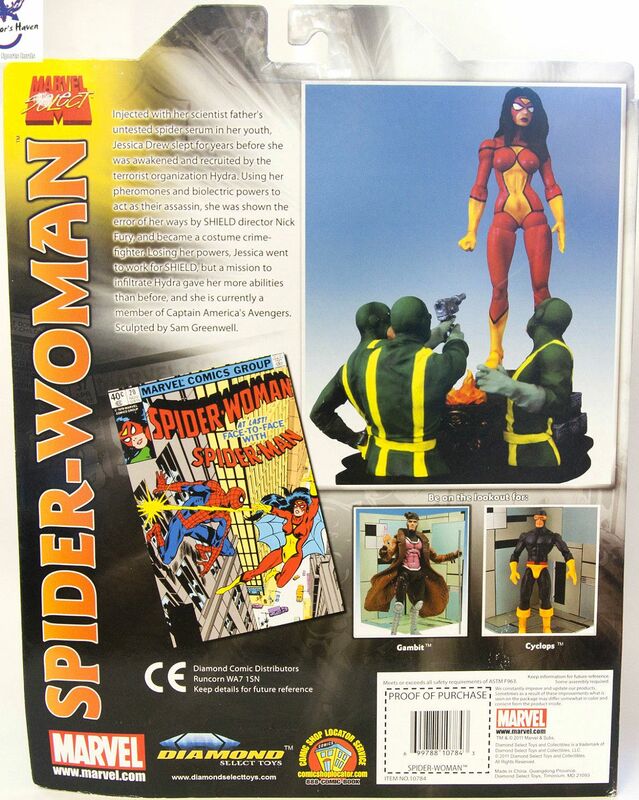 All versions of this Spider-Woman figure come with a Hydra soldier diorama base consisting of three half-bodied Hydro soldiers, a fire pit, a base with a small stone platform, and a venom blast for Spider-Woman. The second variant is a bit more a mystery to me. 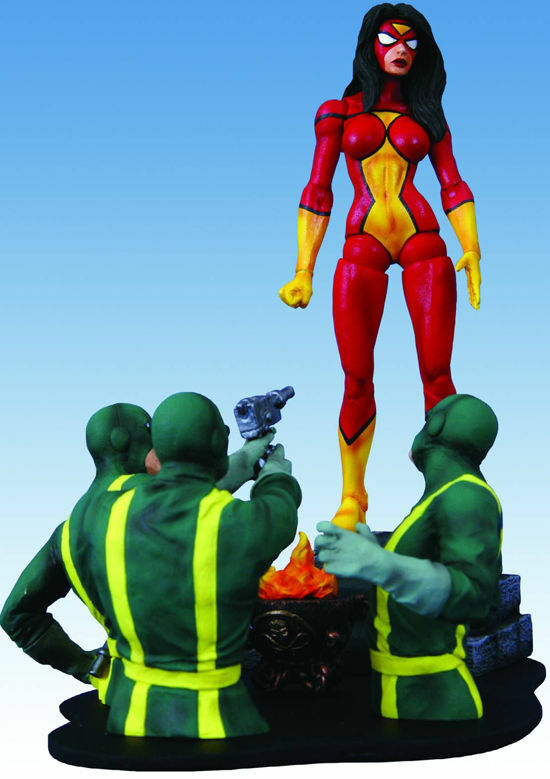 I believe this was a more modern re-release, but it gets confusing because an image of this figure is shown on the cardback of the 2006 release. The version has three major differences plus a few packaging variations. to the original's "lightning-like pattern"
Yeah and I wouldn't be surprised if more were released in the future. It's a great sculpt. Fantastic review (of course), and very thorough review. One of my earlier comics ( when i was 5) was Spider-Woman and The Hulk, and i loved her ever since. So happy Bendis brought her back (and Jocasta, my all time fav). I loved this version and i am thinking of getting the other two versions (bold and Omega Flight) cause of this review. 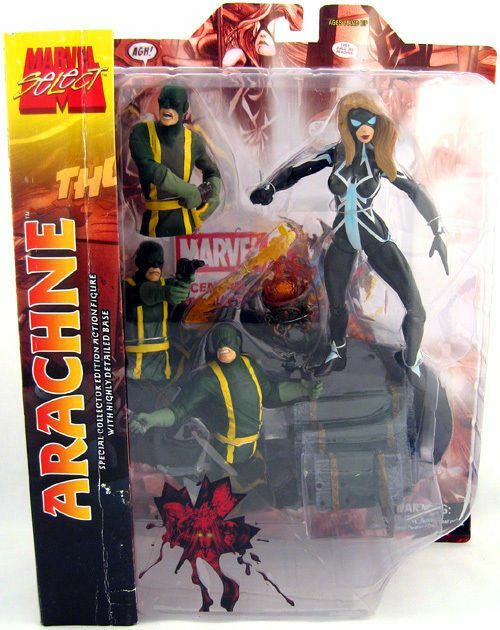 The Marvel Legends one is too weird. Shame this is too big for my ML. I love the Select sculpts and some of them are compatible (Thanos IE.) But i cannot understand how we never have had a Polaris, Monica Rambeau, Jocasta or Mantis. i will die happy if i own this before im 50 and bored with collecting, haha!